This easy, comforting dish of pasta and ground beef gets its great flavor from lots of garlic, spicy seasonings, and tomatoes. Make the dish with elbow macaroni, mini penne pasta, small shells, or another pasta similar in size. 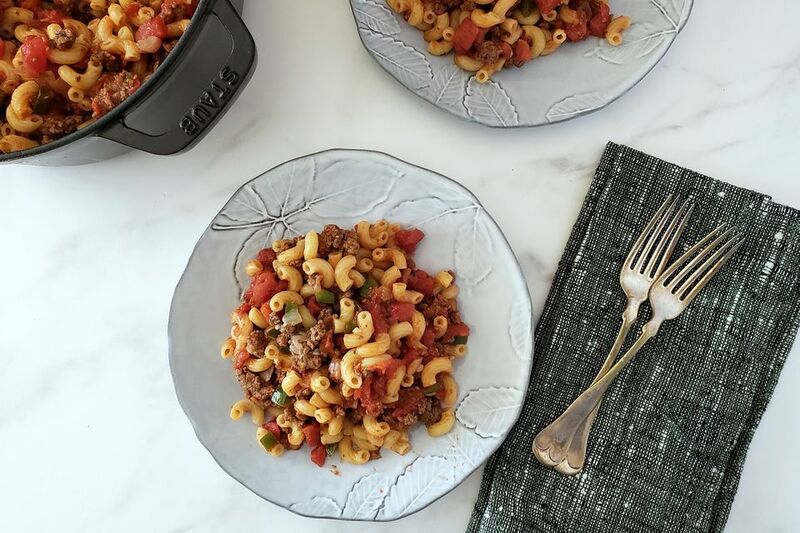 This dish is similar to American chop suey, which is a family favorite comfort food for many. The spicy tomatoes and seasonings add an extra burst of bold flavor. The recipe is adaptable as well. For Italian flavors, replace the Cajun or Mexican seasoning with Italian seasonings and use Italian seasoned tomatoes in the dish. Or, if you prefer a milder flavor, use your favorite seasoned salt blend along with plain diced tomatoes. Serve the pasta and ground beef mixture on plates or in bowls with pepper jack cheese biscuits or crusty bread. Round the meal out nicely with a simple side salad. Cook the pasta in boiling salted water following package directions. Drain well and set aside. Put the ground beef and onion in a skillet over medium heat. Cook, stirring and breaking up the beef until the ground beef is browned and is no longer pink. Add the garlic and bell pepper to the beef and onions; cook, stirring, until the bell pepper is just tender. Drain and discard any excess accumulated fat. Add both kinds of diced tomatoes along with the Mexican or Cajun seasoning, oregano, pepper, tomato paste, and water. Bring the beef and tomato mixture to a simmer and cook for 5 minutes. Taste and add kosher salt, as needed. Add the hot drained pasta to the ground beef and tomato mixture; stir to blend the ingredients. Transfer the macaroni and beef mixture to a serving bowl or serve from the cooking pot. Enjoy the dish with a tossed salad and crusty bread. Homemade Mexican-Style Seasoning: Combine 1 teaspoon of chili powder with 1/2 teaspoon of paprika, 1/2 teaspoon of ground cumin, and a dash each of onion powder, garlic powder, oregano, and cayenne pepper. Homemade Cajun Seasoning: Combine 1 tablespoon of paprika with 1/2 teaspoon of onion powder, 1/2 teaspoon of oregano, 1/4 teaspoon thyme, 1/2 teaspoon of garlic powder, 1/4 teaspoon of white pepper, 1/44 teaspoon of cayenne pepper, and a dash of black pepper. For some extra heat, add a minced jalapeno pepper to the ground beef along with the green bell pepper. Add 4 to 8 ounces of sliced mushrooms to the pot with the ground beef and onions. Make it a Casserole: Transfer the mixture to a lightly greased 2 1/2 to 3-quart baking dish. Top the hot pasta mixture with about 1 cup of cheddar cheese or a Mexican blend of cheeses, along with a few tablespoons of sliced green onions, if desired. Bake in a 350 F oven for about 15 to 20 minutes, or until the cheese is melted and the casserole is bubbling around the edges.